Snapchat’s first attempt at smart glasses didn’t take the world by storm like parent company Snap might have hoped, but that hasn’t stopped the company releasing a second version. Snapchat Spectacles 2 were announced in April 2018 and on sale quite soon afterwards, and while the latest model does feature a few minor improvements upon the first-generation, it doesn’t fix all of the issues we had with the concept. So far there are very few rumors of a third-generation Snapchat Spectacles, but you'll find everything we've heard so far further down in this article, and if any new rumors emerge we'll be sure to add them. For now though, we’ve put together a list of the top things we’d love to see from Snapchat Spectacles V3... if we ever get them. Snapchat Spectacles 3 will probably be a long way away if they ever come out. There was a year and a half break between the first generation and version 2 of the glasses, so it may be a similar amount of time or even more before we see Snapchat Spectacles 3. April 2018 was the release date for the second generation glasses, so we'll have to wait and see how long it will take Snap to update its platform again, but we'd be surprised if V3 lands before late 2019. The one release date rumor so far points to sometime in 2019, which doesn't tell us much. We'd expect the new model to carry a similar price to that of the existing glasses, so the Snapchat Spectacles 3 may cost roughly $149.99 / £149.99 (about AU$270). However, if they have major upgrades they could cost more, with one report putting the price at around $300 (likely £300 / roughly AU$400). We're not convinced Snap would risk a price that high though, given how niche the appeal of its Spectacles seems to be. So far we don’t know much about the third-generation of Snapchat Spectacles, but one report claims that they could include two cameras, allowing for depth effects, as well possibly as integrated GPS and an aluminum frame. That said, the future of the concept is currently very unclear as the first-generation struggled to gain any traction for Snap. The company had to underwrite leftover stock for the original Spectacles, and it’s currently unclear how well the second-generation glasses have been selling for Snap and whether the company will see a third attempt as a worthwhile proposition. However, if a new model is launched it seems likely that it would include further refinements to the design and an improved camera. If Snapchat Spectacles 3 does happen, here’s a list of features and improvements we’d love to see the company integrate to try and improve upon the last generation. Snap improved the design of the first pair of Snapchat Spectacles by losing the yellow ring around the camera and trying to make the glasses look more stylish, as well as adding waterproofing. These still don't look particularly fashionable though. Why not release some metal frame glasses instead of the cheap-feeling plastic design that's currently on all three models? Sure, the price may go up for the more costly materials but we'd love to see Snap offer a variety of styles instead of just the plastic look. Not all sunglasses are built the same. If you go into a shop to buy a pair of glasses, you're usually greeted with a wide range of options of what you can buy. Why can't Snap offer a wider variety than the current three different frame shades paired with different lens colors? We'd love to see metal options as well as other options on the market. If Snap wants its glasses to become a fashion item, this may be the way it can achieve it with its third-generation accessory. Snapchat Spectacles aren't cheap considering there's only really two reasons to wear these. 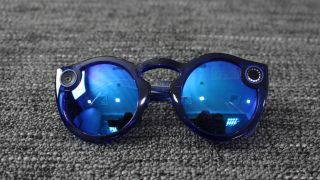 They cost $149.99 in the US and are essentially even more expensive in the UK at £149.99, so we'd love to see the company at least offer a more budget alternative in the Snapchat Spectacles 3 range if it happens. We've asked for more design options, so it would be good to see the price of the plastic glasses drop down while a metal pair of glasses could cost the same as or a touch more than Snapchat Spectacles 2. Connectivity was an issue we ran into with both versions of Snapchat Spectacles, and it's something we hope will be fixed in a third-generation of the product. A couple of times during our testing we found the Snapchat app wasn't able to identify the glasses that were paired with the phone. That's an issue and we hope it's something we won't see on the Snapchat Spectacles 3.